EventCheck Knox is starting a Q&A series for the blog called “Get to Know a Planner.” Regular blog entries will feature planners and experts answering questions about themselves, what makes Knoxville so popular for events and how they solved a big challenge. We kick off this new feature with the spotlight on Kate Jackson, director of event services, for the Knoxville Convention Center. Actually, it kind of just happened. I worked in the restaurant business for 10-plus years and at the time was the sales/bar manager at Amerigo Italian Restaurant. My old college professor was eating in the restaurant one night with the director of event services at the Knoxville Convention Center and mentioned to me that they were looking for an event manager. It got me thinking. I loved working weddings and all of the off-site catering events that we did at the restaurant. I am so glad that I made the decision to change career paths. I am one of those crazy people that absolutely love what I do. The crazier and more difficult the event, the better. The people and the events that I have had the pleasure to work with are part of my family. I love being able to give guests and clients that “wow” experience that they will remember. I have had the pleasure to meet and work with truly amazing people and meet people from all around the world. 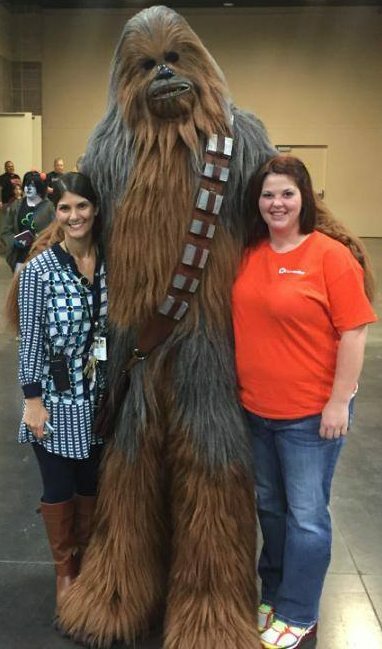 Kate Jackson, left, with Chewbacca and Becky Williams of ACES, the in-house decorator company, at the Fanboy Expo at the Knoxville Convention Center. The Knoxville downtown area has really grown, especially since I first started at the Knoxville Convention Center nearly eight years ago. It is a beautiful and friendly place; you have the Smoky Mountains and Dollywood close by. I think a lot of guests like the central location that allows people from various cities to get here easily. Plus, we have an amazing football team. People love the Southern hospitality that they get when they come to our city. We had a huge conference and trade show in the building, and we had a challenge to fit 620 people, salad buffet, drink stations, food buffet, server station, hot boxes and break-down areas. We did not have the ballroom or any rooms available that could accommodate 620 people. I talked with the client and came up with two options – putting them inside on the Clinch Concourse or ordering a tent and putting them outside on the Park Terrace. The tent seemed to be the best choice but considering the event fell in November, you can imagine that we had some weather challenges. We talked the client into using a tent outside, which was the best option considering we had another event going on, and the Clinch Concourse is the main entrance into the building. We had space challenges on Clinch Concourse, as well. I ordered a tent with chandeliers, sides and even heaters under the tent to cover any issues. The first day the weather was beautiful, and the tent worked out perfectly. Overnight, there was a downpour, and it was drizzling the next morning. When I arrived to work that morning, the tent was flooded and completely wet. So, we moved the entire luncheon upstairs to the Clinch Concourse. I ordered pipe and drape and door decals at the last minute to make it a private area and had signs for the other event to use other entrance doors. We set the tables, buffets and the server areas, and the event went perfectly. What is the most memorable thing that happened during an event? When we had the Medal of Honor Society Convention here in 2014, it was truly amazing meeting the Medal of Honor recipients. The room looked spectacular, and it was truly an honor to work this event. I met some incredible people. I love hanging out with my family and friends, and I am a huge Pinterest addict. I love planning my daughter’s birthday parties. 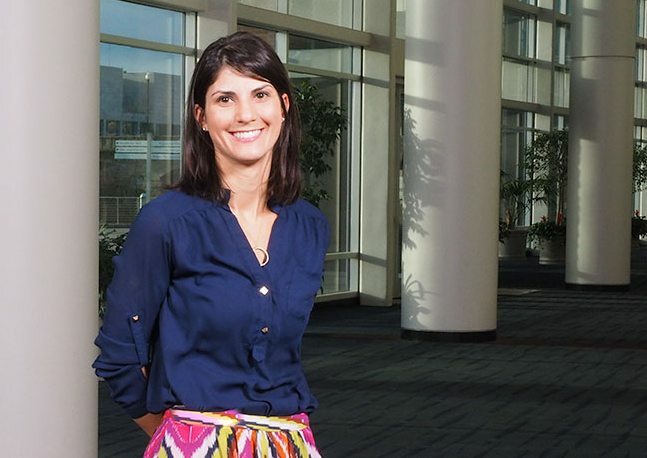 In addition to her work as a planner, Kate Jackson was a member of Introduction Knoxville 2015 and spearheaded the Convention Center’s employee campaign for the United Way of Great Knoxville. She also has volunteered for the United Way. Jackson was the chair for five years for “Martinis and Movies,” an annual benefit for the Knoxville chapter of the Cystic Fibrosis Foundation; a mentor in 2016 for tnAchieves; and a volunteer in 2010-12 for the Komen Knoxville Race for the Cure. Kate is great to work with on events! Nice article. I completely agree! Thank you for the comment.